Director/Screenplay – Zak Hilditch, Based on the Novella by Stephen King, Producer – Ross M. Dinerstein, Photography – Ben Richardson, Music – Mike Patton, Visual Effects – Siamese (Supervisors – Andrew Buckley & Merlin Eden) & The Institution Post (Supervisor – Daniel Barone), Special Effects Supervisors – Beau Fortier & Jak Osmond, Makeup Effects – Joel Echallier, Production Design – N.C. Page Bruckner. Production Company – Campfire Productions. In 1930, Wilfred James sits in a hotel room in Omaha and writes his confession. Back in 1922, Wilfred owned the eighty-acre Hemingford Home farm in rural Nebraska. His wife Arlette inherited an adjoining hundred acres after the death of her father. She decided she wanted to sell her half of the property and move to the city but Wilfred was opposed to the idea. Their fifteen year-old son Henry had become involved with a neighbouring girl and did not want to leave. Wilfred played on this and persuaded Henry to join in a plot to kill Arlette. After she got drunk one night, they held her down and Wilfred slashed her throat. They disposed of her by throwing the body down the well and concocted a story about her having walked out on them. However, what happened continued to plague the two of them long after the event. 1922 comes out in a year that has produced a bumper crop of Stephen King adaptations. At the head of the crowd was the enormous theatrical success enjoyed by the remake of It (2017). Elsewhere we also had to varying degrees of success the films The Dark Tower (2017), 1922 and Gerald’s Game (2017) and two entire tv series adapted from King novels with The Mist (2017) and Mr. Mercedes (2017– ). This is something that has presaged a whole bunch of upcoming King adaptations. 1922 is based on the novella of the same name that appears in the King collection Full Dark, No Stars (2010). The film version was made by Australian director Zak Hilditch who had previously made the highly impressive End of the World film These Final Hours (2013). The film was released directly to Netflix. 1922 is not quite the horror film you expect it to be. If anything, it approaches more the territory of King’s Dolores Claiborne (1995), which did not have enough material to meet the criteria for inclusion here, and its focus around the state of mind of someone who plots an act of murder. 1922 pushes this far more into the territory of dark psychology. That said, it is still far more of a state of mind film rather than it offers anything in the way of jumpshocks that you would expect of a horror film. We do get the appearance of some possibly imagined rats and the bloody figure of Molly Parker’s corpse, In these moments, it starts to approach something of Repulsion (1965) territory. There is often a sense of Baptist morality/thinking in King’s works and 1922 represents this at its strongest – it is entirely a work about crossing the line into sin and the poisonous fruits that come from one terrible deed. If you had to offer a capsule summation of 1922, you could call it Terrence Malick’s Days of Heaven (1978) crossbred with something of Grant Wood’s American Gothic (1930). Zak Hilditch does a fine job of portraying the bare open cornfields and period setting. 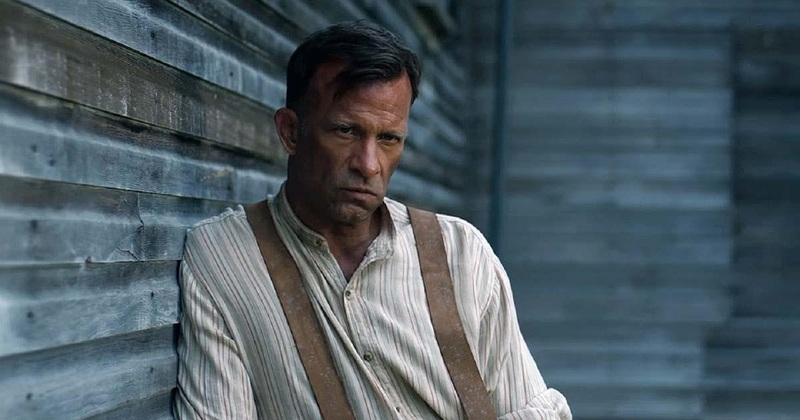 Thomas Jane – in his third performance in a Stephen King work following Dreamcatcher (2003) and The Mist (2007) – spends his whole time brooding, even if his Midwest accent and slow hayseed drawl starts to tire after a time. The screen adaptation is extremely faithful to the original King novella – perhaps the most faithful that one has seen to date of any King adaptation. Other Stephen King genre adaptations include:- Carrie (1976), Salem’s Lot (1979), The Shining (1980), Christine (1983), Cujo (1983), The Dead Zone (1983), Children of the Corn (1984), Firestarter (1984), Cat’s Eye (1985), Silver Bullet (1985), The Running Man (1987), Pet Sematary (1989), Graveyard Shift (1990), It (tv mini-series, 1990), Misery (1990), a segment of Tales from the Darkside: The Movie (1990), Sometimes They Come Back (1991), The Lawnmower Man (1992), The Dark Half (1993), Needful Things (1993), The Tommyknockers (tv mini-series, 1993), The Stand (tv mini-series, 1994), The Langoliers (tv mini-series, 1995), The Mangler (1995), Thinner (1996), The Night Flier (1997), Quicksilver Highway (1997), The Shining (tv mini-series, 1997), Trucks (1997), Apt Pupil (1998), The Green Mile (1999), The Dead Zone (tv series, 2001-2), Hearts in Atlantis (2001), Carrie (tv mini-series, 2002), Dreamcatcher (2003), Riding the Bullet (2004), ‘Salem’s Lot (tv mini-series, 2004), Secret Window (2004), Desperation (tv mini-series, 2006), Nightmares & Dreamscapes: From the Stories of Stephen King (tv mini-series, 2006), 1408 (2007), The Mist (2007), Children of the Corn (2009), Everything’s Eventual (2009), the tv series Haven (2010-5), (tv mini-series, 2011), Carrie (2013), Under the Dome (tv series, 2013-5), Big Driver (2014), A Good Marriage (2014), Mercy (2014), Cell (2016), 11.22.63 (tv mini-series, 2016), The Dark Tower (2017), Gerald’s Game (2017), It (2017), The Mist (tv series, 2017), Mr. Mercedes (tv series, 2017– ), Castle Rock (tv series, 2018– ) and Pet Sematary (2019). Stephen King had also written a number of original screen works with Creepshow (1982), Golden Years (tv mini-series, 1991), Sleepwalkers (1992), Storm of the Century (tv mini-series, 1999), Rose Red (tv mini-series, 2002) and the tv series Kingdom Hospital (2004), as well as adapted his own works with the screenplays for Cat’s Eye, Silver Bullet, Pet Sematary, The Stand, The Shining, Desperation, Children of the Corn 2009, A Good Marriage and Cell. King also directed one film with Maximum Overdrive (1986).